Come join us at Pleasant View Recreation Campground and Cabins in Van Buren, Ohio. The campground is a clean, quiet, gated park in a country setting. 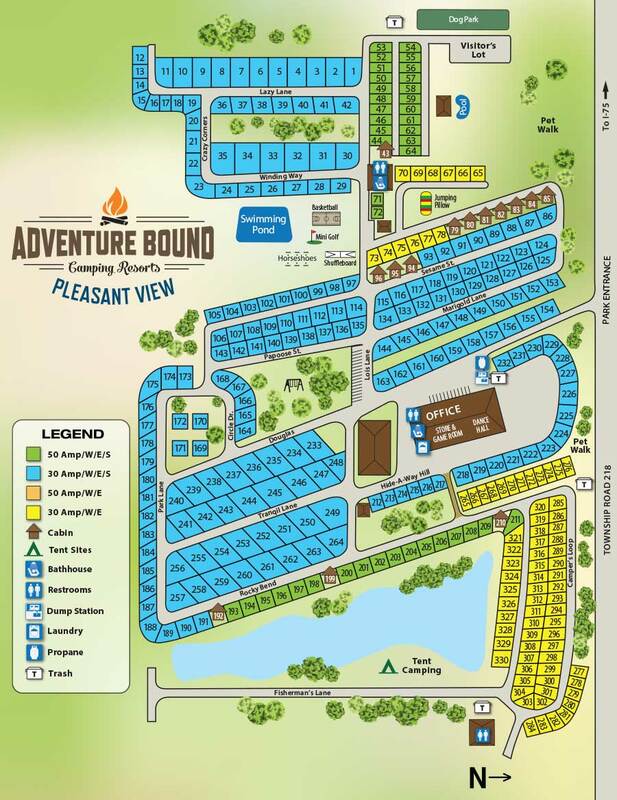 Located next to Van Buren State Park with miles of walking trails and disc golf, we are a family campground where you can enjoy a variety of planned activities in a warm and friendly atmosphere. Whether you camp overnight or for the season, you’ll enjoy the swimming pool, playground, jumping pillow, and Bingo on Friday and Saturday nights. The camping sites are both open and shaded and most are level pull-thrus. For the comfort and convenience of clubs, reunions and other groups, there are outdoor pavilions and indoor meeting rooms and a kitchen for rent by reservation only. Whether you’re looking for lots of activities or just a relaxing getaway, Pleasant View has just what you’re looking for! Whether you camp overnight or for the season, you’ll enjoy the swimming pool, playground, jumping pillow, and Bingo on Friday and Saturday nights.